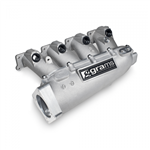 The Grams Performance & Design Modular High Performance Intake Manifold for the VW MKIV 1.8T has arrived! Our unique two-piece modular intake manifold has been designed to be a bolt-on replacement for the anemic OEM unit, incorporating a removable plenum lid that not only allows for easy disassembly, porting, and plenum volume changes but can also be rotated to position the throttle body on either the driver or passenger side of the engine bay. The Grams Performance & Design 1.8T intake manifold is the perfect addition to a lightly modified street build as well as high-horsepower builds with turbo upgrades! Your factory intake manifold is designed to channel air into the engine just well enough to meet stock horsepower levels, leaving room for significant improvement on performance builds utilizing larger than stock turbochargers. IE's 1.8T 20V intake manifold has been designed as a true performance design with major motorsport features. Optimized tuning of the intake manifold runner lengths, diameters, and bellmouths work together to ram more air into the cylinders. The plenum and runners are optimized with computer software for maximum flow. This very specialized design work results in a market leading intake manifold design capable of over 90HP gains! Obsessively engineered and dyno tested, this intake manifold delivers the best power results possible in any condition. Due to the unique plenum, velocity stack, and runner design all setups with GT28 or larger turbos will see gains throughout the mid-high RPM range with very little low-end power sacrifice. Our intake manifold allows the throttle body to be installed on either side of the engine bay due to the modular plenum design. The entire plenum disconnects from the runners and can be flipped in either direction allowing you to install the manifold with only minor changes on virtually any turbo setup. Specialized engineering software was used to research and develop a truly optimized runner and velocity stack design. Aggressively sized resonance tuned manifold runners and flow tested velocity stacks deliver more air to the cylinder than any other manifold on the market. The IE manifold provides an optimal balance of power gains while minimizing loss in spool time and low-end power. Depending on the engine and turbo setup, the manifold will typically result in very little added turbo lag when compared to other manifolds with similar sized runners and plenum. IE manifolds are cast from a special self aging, self hardening alloy with especially strict requirements for chemical composition. Top of the line Japanese machining centers machine all major surfaces of the parts in one setup, ensuring perfect fit, finish, and a lifetime of service. This manifold includes the IE micro vacuum manifold at no extra charge. This samll anodized fitting provides all of the vacuum sources needed without the worry of cluttered lines. Installs fast and easy, providing a sleek and clean solution to plumb your blow-off / diverter valve, boost gauge, fuel pressure regulator, brake booster, or anything else requiring a vacuum source.